Admin Center is rolling out to all accounts over a number of days. If you don't see Admin Center in the product tray, it's not in your account, yet. Instead, to set the password security level in Support, click the Admin icon ( ), then select Settings > Security > Agents & Admins or End users. Zendesk provides the following levels of password security: low, medium, and high. If you're on Professional or Enterprise, you can specify your own custom password security level. Each level has stricter requirements for choosing passwords. You can set one password security level for end users, and a different one for admins and agents. Only administrators can change the password security level. Note: You can use a single sign-on (SSO) solution instead of using Zendesk passwords. See SSO (single sign-on) options in Zendesk. 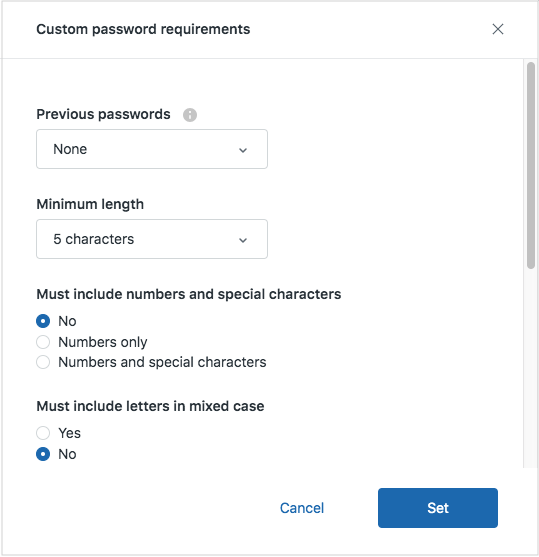 Low - Each password must have at least 5 characters. This is the default security level. Previous passwords - New passwords must be different from the number of previous passwords you set. Failed attempts until lockout - If an end user or agent fails to enter their password correctly the number of times you specify in a row, they are locked out and cannot sign in again until they reset their password. You must be an administrator to change the password security level. If you increase the security level, all passwords set with a lower security level are set to expire in 5 days. End users must change their passwords to comply with the new security level. The next time they log in, Zendesk alerts them to change their passwords. Zendesk also sends email notifications to administrators and agents three days before a password expires, and then on the day it expires. Click the Security icon ( ) in the left sidebar. Click the Staff members or End users tab. You can set one password security level for end users, and a different one for staff members (admins and agents). Select one of the security options, then click Save. Account owners can allow administrators to set passwords for users. However, Zendesk recommends that you leave this option disabled for security reasons. It prevents hackers from using social engineering techniques to deceive well-meaning people into providing confidential information. For example, one technique used by hackers is to repeatedly call or spoof-email a support center posing as a frustrated customer who forgot his or her password and who is unable to recover it, and persisting until an agent has no choice but to change the password manually for the irate customer. Once the password is changed, the hacker has access to confidential information. Note: Even if the option is disabled, admins can still reset passwords (as distinct from setting passwords). An email is sent to the user's registered email address containing a link that lets the user reset the password. See Resetting user passwords. If single sign-on (SSO) is enabled, admins can't send password-reset links to users. You can also set user passwords through the API. See Set a user's password. In the Passwords section, select Enable admins to set passwords. You must be the account owner to see this setting. You can set Zendesk to automatically sign out agents and other team members after a period of inactivity. Agents remain signed in as long as they actively use the product. Active use includes typing and clicking links. In the Authentication section, set the Session expiration time. For a good article on the subject, see Choosing Good Passwords - A User Guide. For more information on securing your private information, see Security best practices. What are the timeouts when using Single Sign On with ADFS? @Todd - When using SSO, sessions will expire after 8 hours. After the 90 day expiration, can the end-user re-activate their own account or does an agent need to be involved? I want to increase security from low to high, but do not want to increase our ticket volume. Thanks. @Chris - When a user's password expires, they will be notified when they next try to log in, then they will be forced to set a new one. No agent involvement needed! Will Light Agent's also receive the same expiration notifications? This notification will go out to any user who has an expired password. The wording in the 'your password is about to expire' email to agents appears to be out of date so how do we update this please? Hi David! Welcome to the Community! I'm not sure I understand your question. Can you please be more specific about what you're referring to? Many thanks indeed for responding and sincere apologies that my previous wasn't clear. However these instructions need updating to read something like "Once you've signed in, click the avatar icon in the upper right corner and select 'view profile'. In your user profile, open the 'Security Settings' tab and click 'Change' in the 'Password' section and follow the on-screen instructions." Alas I'm unable to locate the functionality to update the email text myself and I'm hoping that you will be able to assist me please? Hey David! Thank you so much for clarifying! I see what you mean now. The text for the password reset email isn't customizable...it's a system message. I'll be sure to pass this on to the right team to see if they can update that. Thanks for bringing it to our attention! would be great if the custom option for Zendesk password security level could be available for the end-user tab. Is this in your roadmap ? It is not currently in our roadmap. If you'd like to share your idea in the Support Product Feedback topic other users are more likely to see it there, comment as to whether they have a similar need, and up-vote your idea. Posts that receive a high level of engagement there are passed on to product managers for consideration.